April showers bring new Cristian Rivera Foundation events. All the hard work we’ve put into raising DIPG awareness in 2018, is finally starting to blossom. As things start to blossom and the temperature continues to rise, approaching with “Full Steam Ahead” is the 1st Annual Cristian Rivera Foundation Full Steam Ahead 5K. The 1st Annual Cristian Rivera Foundation Full Steam Ahead 5K is making a stop at Van Cortlandt Park in the Bronx on Saturday, June 9th at 9am. We’re looking to fill up the seats in our train so, bring your family, friends and colleagues together and join us while we run/walk for a DIPG cure. Van Cortlandt Park is 15 minutes from Manhattan and the George Washington Bridge. The registration process will begin at 8:30 AM and the Run/Walk will commence at 9:00 AM. This event will raise money to increase public awareness of DIPG, as well as raise funds that will provide financial support to families and medical facilities that conduct innovative research and clinical trials. Take a stand against DIPG with us by sponsoring, participating, volunteering and donating in the 1st Annual CRF “Full Steam Ahead” 5K. You can help us continue our progress and give hope to more children and families affected by DIPG. Take a stand against DIPG with us by getting involved the 1st Annual CRF “Full Steam Ahead” 5K. Run or Walk in 5K. Entry fee is $25 and includes a 5K t-shirt. We encourage participants to fundraise a minimum of $250. (This is NOT a Mandatory Amount), but we encourage you to fundraise as much as you can! Every dollar you raise will help us sustain and grow our programs. Please help us beat DIPG. To sign up to participate in the 5K please visit http://cristianriverafoundation.org/crf5kwalkrun/register/. 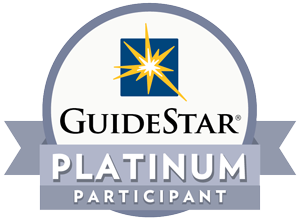 Become a Virtual Participant in the 5K. If you live outside the Tristate area or going to be out of town, become a Virtual Participant! The entry fee is $25 and includes a 5K t-shirt. Take a picture with your t-shirt and e-mail it to crf5K@cristianriverafoundation.org and we will post it on our site. We encourage participants to fund-raise a minimum of $250. (This is NOT a Mandatory Amount), but we encourage you to fund-raise as much as you can! Every dollar you raise will help us sustain and grow our programs. To sign up as a Virtual Participant in the 5K please visit http://cristianriverafoundation.org/crf5kwalkrun/register/. Create a Team. Each team member is required to pay the $25 entry fee and will receive a 5K t-shirt. We encourage each team member to fund-raise a minimum of $250. (This is NOT a Mandatory Amount), but we encourage you to fundraise as much as you can! Every dollar you raise will help us sustain and grow our programs. To create a team and take part in the 5K please visit http://cristianriverafoundation.org/crf5kwalkrun/team-registration/. Join a team. 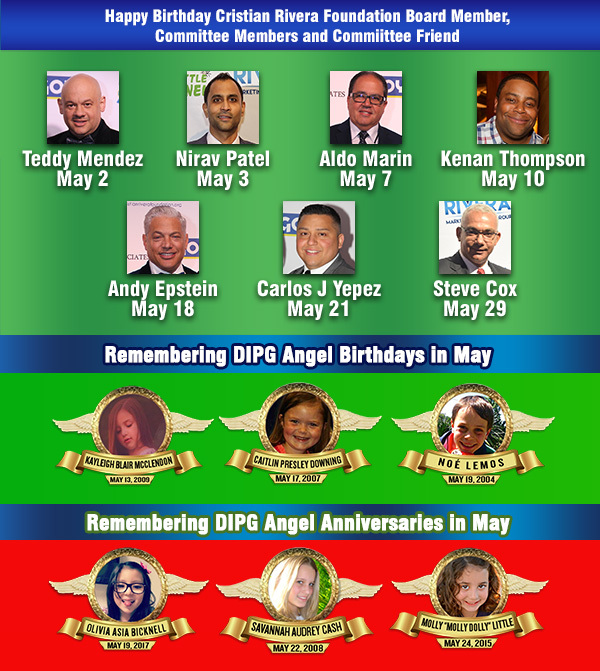 You’ll be able to raise funds for DIPG along with your family, friends and colleagues. Each team member is required to pay the $25 entry fee and will receive a 1st Annual Cristian Rivera Foundation Full Steam Ahead 5K Run/Walk t-shirt. We encourage each team member to fundraise a minimum of $250.00. If any team member fails to meet the quota, they will still be able to participate in the 5K and take a stand against DIPG. To join a team and take part in the 5K please visit http://cristianriverafoundation.org/crf5kwalkrun/team-registration/. Become a Volunteer. To become a volunteer for the 5K please visit http://cristianriverafoundation.org/crf5kwalkrun/volunteer/. Donate. Help support raising funds for DIPG by donating. To make donations please visit http://cristianriverafoundation.org/crf5kwalkrun/donate/. Just remember that signing up to get involved is just the first step – fundraising is what makes the difference! Hop on board and together we can help the 300 children diagnosed each year. 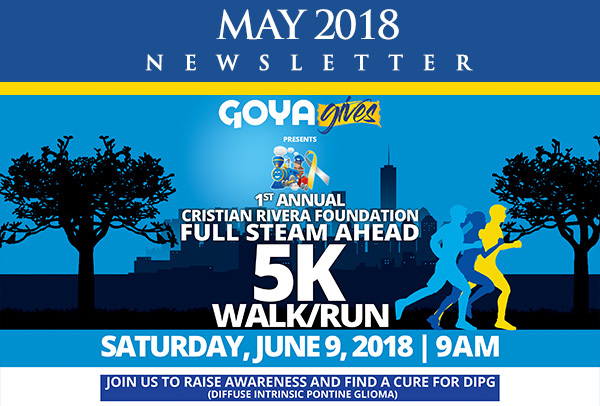 Our foundation would like to acknowledge Goya Foods for being the Presenting Sponsors for the 1st Annual Cristian Rivera Foundation Full Steam Ahead 5K. Goya is our largest corporate sponsor and are Platinum Sponsors for our Annual CRF Celebrity Gala. Here at the foundation, we appreciate Goya’s dedication to our cause. We would also like to give a big thank you to Rivera Marketing and Media Group for becoming a Platinum Sponsor for the 1st Annual CRF “Full Steam Ahead” 5K. The Little Kernel, Joule Entertainment and Weill Cornell Medical Center for becoming Gold Sponsors. Medicare & Medicaid Advisory Group and Calle Ocho for becoming Silver Sponsors. Lastly, CarePoint Health and Patrick B. Jenkins & Associates for becoming Bronze Sponsors. All of these sponsors have continuously supported our foundation and we truly appreciate their efforts. Want to follow in these sponsor’s footsteps and run/walk for DIPG awareness? Visit cristianriverafoundation.org/crf5kwalkrun/sponsorship for details. Deadline for Sponsorship must be in before Friday, May 25th, 2018 at 5 p.m. Sponsoring, participating, and volunteering in the 1st Annual CRF “Full Steam Ahead” 5K isn’t the only way you can get involved. 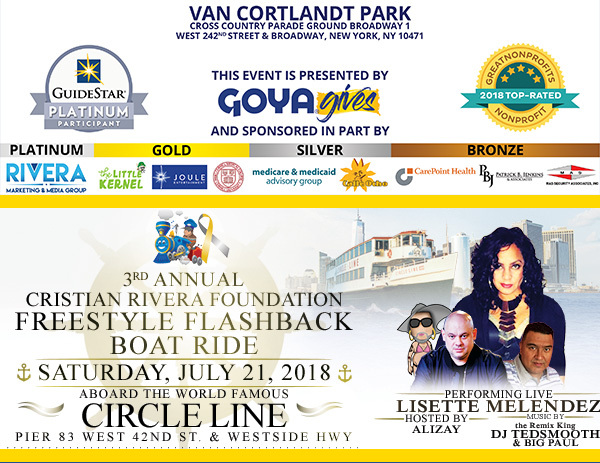 You can also purchase tickets to the 3rd Annual Cristian Rivera Foundation Freestyle Flashback Boat Ride on Saturday, July 21, 2018 at 7:00 p.m., featuring a performance by Freestyle Diva Lisette Melendez. Get your ticket $30 ticket today, you don’t want to miss out on this amazing evening or discount deal. After June 1st the tickets will go up to $35 and will increase to $40 after July 1st. Don’t wait and purchase your tickets today here: cristianriverafoundation.org/events.html#3rdboatride. Whether you are sponsoring, participating, volunteering, or donating, you are helping in making a difference in the lives of the 300 children diagnosed with DIPG every year. Hop on board and help us make 2018 the year we say goodbye to DIPG. We thank you for your continued support and look forward to helping those affected by DIPG with your help. and incurable brain stem tumor. Diffuse Intrinsic Pontine Glioma or DIPG, is a Rare, Inoperable Brain Stem Tumor that predominantly affects children between the ages of 2 and 10. Only 200-300 cases are discovered in the United States each year and because there is no cure, it’s young victims only have an average of 3-18 months to live, after they’ve been diagnosed. There are NO SURVIVORS. The Cristian Rivera Foundation is a 501 (c)(3) Non-Profit Organization that works tirelessly, in order to raise awareness and funds to one day put a STOP to this disease. The Cristian Rivera Foundation funds the work of Dr. Mark Souweidane of Weill Cornell Medical Center – Memorial Sloane (Kettering) Cancer Center and Dr. Oren Becher of Ann & Robert H. Lurie Children’s Hospital and the Lurie Cancer center at Northwestern University. Both Doctors are conducting promising research and trials that have shown promising results. We are CLOSE to a CURE! Every Donation Big or Small, will help us achieve our goal. Help spread the word to your family, friends and Colleagues. Weill Cornell Medical Center. Thank you for bringing us closer to a cure. Andy Epstein and Darlene Rodriguez. Teddy Mendez and William Pla. and The Late Miriam Colon. Copyright © 2018 Cristian Rivera Foundation, All rights reserved.